The Wall Street Journal reports that Apple has started mass production of the iPad mini. Apple Inc.'s Asian component suppliers have started mass production of a new tablet computer smaller than the current iPad, people with knowledge of the situation said, as the Silicon Valley company tries to stay competitive against rivals such as Google Inc. GOOG -0.63% and Amazon.com Inc. AMZN -0.56% that are offering smaller, less-expensive alternatives to the iPad. The Wall Street Journal cites two sources who also confirm that the iPad mini will use a 7.85" screen with a lower screen resolution than the 3rd Generation iPad. The iPad Mini has been previously rumored to have a 1024x768 pixel display. Mockup of 7.85-inch "iPad mini" next to full-size iPad. The report comes just after a similar claim from Japanese site Mac Otakara, who specified that the iPad mini had begun production in Foxconn's factories in Brazil. The Wall Street Journal's report seems to provide additional confirmation. 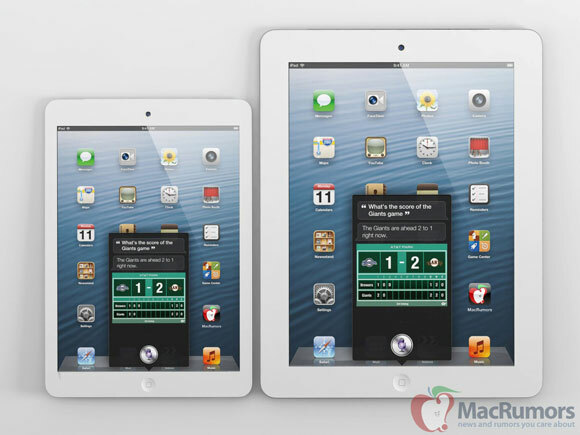 Recent reports have suggested that the iPad Mini media event will take place in October. iPad, iPad, iPad, iPad, iPad, iPhone, iPhone, iPad, iPad. Where are the MAC rumours???????????? I really find it hilarious that there are still people saying this isn't going to happen. Does WSJ have a good track record for predictions? I wonder if the iPad Mini will come with the same wifi issues, bluetooth drop-outs, scuffs, scratches, dents, camera purple-fringing, terrible Maps app, lack of accessory support and with no adaptors available. Yep, still no pics of a new iMac in production. Doesn't look good. Don't give a flying ****** about a small iPad. The one I have is perfectly fine. This is sooooo not going to happen. And if it does will be Apple's biggest blunder in a long time. Good insights. Thanks. Having considered your comment, I've just crossed buying an iPad Mini off my wish list entirely. So Apple would definitely be foolish to move ahead with this now.